I gave a lightning talk called Manifesto for Flexible Agile Transformation in Scan-Agile 2019 conference. The manifesto consists of four things I have come to value based on my own experience in software development. 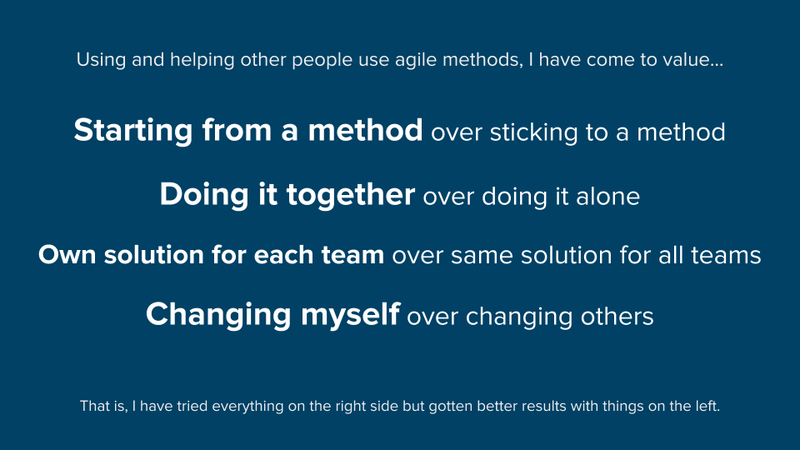 It’s a great idea to start to follow some agile method (e.g. scrum, kanban, less, safe) if you have no idea where to start. It’s even a better idea to keep continuously improving the method to fit your needs, when you learn more and start to understand which things work for you and which don’t. I have never seen a method that works flawlessly, and there’s no reason to stick with something that doesn’t work just because it says so in the instructions. There’s no way copying just the end result of someone else’s path of trial and error will match your situation perfectly. You need to start somewhere, and then pave your own path from there. Two or more different teams will not usually have the same problems. The context is different, people are different, the goal is different. Therefore it’s not likely that same solutions will work either. It makes more sense to let the teams themselves decide what to improve and where to focus, than to push the solutions from some central organization unit. Many years ago in a big corporation, we had a quality department giving orders what to improve. For example, one month each team was tasked to start pair programming, and to report to quality department have they done it. That felt crazy. I like pair-programming, but I much rather have every team doing whatever they feel makes them achieve better results in their situation. I love trying to change others, and I hate admitting that only one I really can change is myself. For others, I can only listen, coach, maybe show example and share some ideas. But rest is up to them. As a conclusion, I have tried (and keep trying) everything on the right side of the manifesto but gotten better results with everything on the left. What I hope you might take away from this: find your own way, try stuff out, do what helps to get results and start leading by your own actions. In other words, do agile in an agile way. Previous What Kind of a Team We Want to Be?